The Eyes x 9 palettes features a wave of coordinated hues, offering countless combinations. 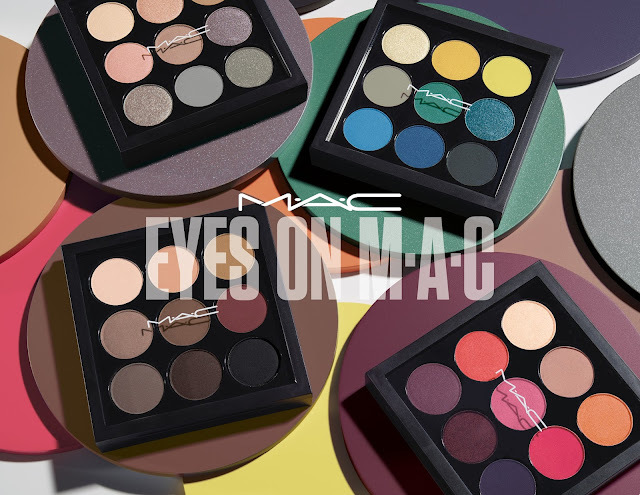 Four new Eyes x 9 palettes join old favorites, featuring rich smoky browns, frosty metallics, red-hot shades and lush tropical-inspired hues. It comes in a pocket-sized compacts for easy portability. It has a clear, hard plastic top that also has a magnetic closure. The eyeshadow pans are the size of a U.S 10¢ coin, about 0.02 oz each. A well edited palette of red-toned hues. Textures ranges from matte to satin to veluxe pearl. This palette has beautiful sunset colors which I would love to try and create on my eyes. A beautiful all over the lid shadow is vanilla - ivory with reflects (velvet), OR even for a brow bone highlight. A nice subtle crease shadow, for your pleasure - muted neutral pink (matte). For a transition shade, get closer - muted yellow orange (satin) is perfect for those "sunset eyes". If you're bold enough use carnal charm - bright yellow red (matte) all over the lid OR use it as liner. I would use bijou - bright blue pink (matte) to line my lower lashes or an inner corner highlight. This ones a hard shade for me, fuchsia fury - mid-tone red pink (satin) but I would try using this as a liner or layer it with one of the darker shadows below. 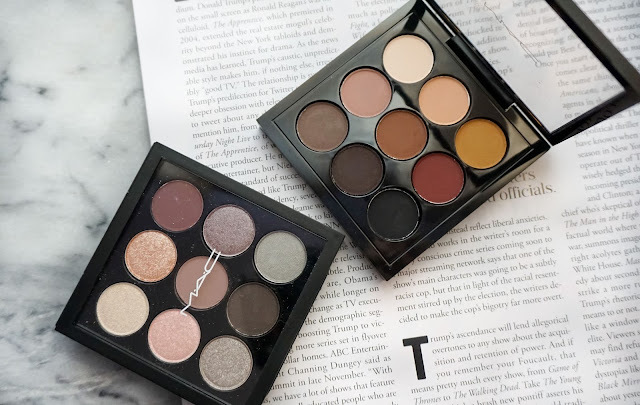 The next three shadows I would use to create a beautiful smokey eye. This would be the palette I would bring with me to my beach vacation. A palette full of vibrant tropical-inspired hues. Textures range from matte to satin to veluxe pearl. A great all over the lid shade is fresh blade - pale frosted yellow (veluxe pearl). Use it as a liner or on the crease, bright-sided - canary yellow (satin). A great inner corner shadow is lemon rush - bright yellow lime green (matte). A great base/ transition shade for a vibrant smokey eye look is lady grey - soft muted grey-green (satin). Another beautiful all over the lid shade, neoprene green - kelly green with pearl (veluxe pearl). Add some sparkle to that green eye look with she's a model - blackened teal with pearl (lustre). Apply this on the lower lash line, liquid sky - cerulean blue (matte) to complement the green or yellow eyeshadow. Use this as a nice liner, blue envy - frosty royal blue (veluxe pearl) and wing it out for fun! 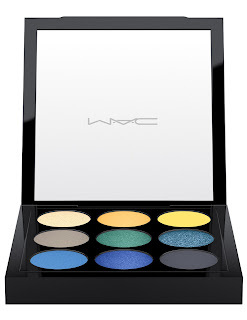 Smoke out that eye look and deepen the colors with grey horizon - deep blue grey (matte). A palette featuring frosty metallic hues. Textures range from veluxe pearl to lustre to frost. This palette is 50/50 for me. I can see myself using half of the shadows in this palette, and after swatching these, some shadows will be a tricky one to apply. I usually don't use an eyeshadow primer for my arm swatches but for this palette to get the frosty shades to show, an eyeshadow primer had to be used. moon rock - frost bright white (veluxe pearl) is gorgeous for an inner corner highlight. I had a hard time swatching copper aura - pastel coral (lustre). Use your finger to apply it and with a patting motion, this would look nice as that center lid highlight. I love blackberry - muted burgundy-plum brown (matte)! If used as the base, it will complement the shimmery shadows really well. sugared - light frosty pink (lustre) is another shimmery shadow that was tricky to apply. Use your finger and with a patting motion. For a beautiful transition shade, use quarry - soft muted plum-brown (matte). One of my favorite shades in this palette is metalmauve - soft lilac (frost). I'd use this as an all-over shadow on the lid. Another nice all-over-the-lid shadow is cosmic - taupe (frost). soot - cool grey (velvet) is a great shadow to smoke out your eye look and as a liner. lunar cycle - frosty muted teal (frost) is a beautiful cool toned shadow, I'd use on my lower lash line to help open up the eyes. 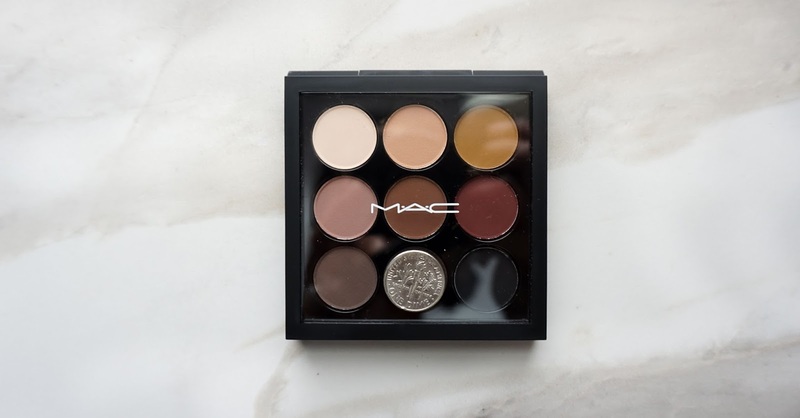 A palette of smoky brown hues, all in a rich matte texture. My favorite of the four! This is a great palette with all matte shadows that you can easily use by itself and also use with other palettes. If you're building you're "ultimate eyeshadow palette", these shadows are a must-have as these are all great core shadows to have. For a nice base is drawing a blanc - creamy beige. bamboo - light beige with pink, can be used as an all over the lid base shadow as well or on the crease. For a smokey eye look, outre -mustardy brown is a nice transition shade to use. pink sienna - cool neutral pink is another great all-ove-the-lid or crease shadow. mocha minded - chocolate brown is a nice shade for a daytime smokey look. everyone's darling - warm wine burgundy can be applied in the outer corner. And for a darker smokey eye look, add any of the last three shadows. All three can also be used as a liner as well. Overall these are great additional palettes to the Eyes on M•A•C collection. The packaging on these are very sturdy, so it's a nice palette to travel with or for the makeup bag. It would be nice to have a mirror instead of the clear plastic but the shadows are well worth the price of these. The pans are big enough to get an eye makeup brush there, and I won't be surprise if I hit pan on one or a few shadows since most are really easy to wear by itself or with the other shadows within it's palette.